Trump brought up the specter of the the November Election being rigged against him on August 1, 2016 in Columbus Ohio. This was the first time since the dawn of the computer age circa 1973 that a Presidential candidate in a major party voiced in a major speech that a Presidential election could be rigged (video clip linked below). Trump also discussed the subject on Fox’s Hannity and O’Reilly shows shortly after the Columbus, Ohio rally. Furthermore, on August 11, 2016 Trump told one of his rallies in Pennsylvania that if he lost in Pennsylvania it would only be because of election fraud. 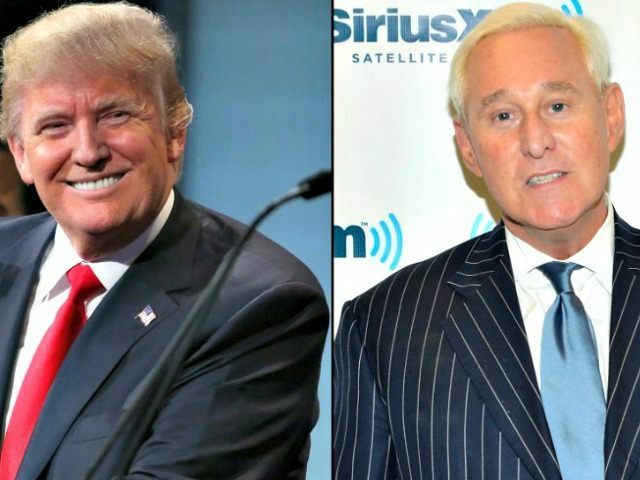 Three days before Trump first mentioned the election fraud issue at his August 1 rally in Columbus, Ohio, Roger Stone appeared on Breitbart radio. On July 29th, 2016, during a radio interview carried on the Milo show, Roger Stone (long-time political strategist, long-time Trump confidant, and best selling author, “The Clinton’s War On Women”, etc.) hit a bulls-eye on the fact that the main danger facing American voters in the 2016 Presidential election is COMPUTERIZED vote fraud perpetrated by the handful of mega-election vendors who are have been hired by brain-dead or subversive county election officials to process about 96% of the USA vote on secret, easily-rigged computer programs. Thus, FOR THE FIRST TIME, the issue of computerized election fraud, as exposed in the HBO documentary, Hacking Democracy, on the website www.ElectionNightGatekeepers.com , and in many other places – has been brought onto the national stage for all to see. In this four minute Breitbart video, Stone also pinpointed how Mr. Trump must deal with the computer election fraud issue. Stone further correctly identified computerized vote switching by a handful of mega-election vendors as the main problem facing Trump and the American electorate this November. In other words, as an example, every 3rd vote for Trump could be silently switched to Hillary Clinton inside the easily-rigged election computers. This is possible because American voters are essentially barred by police guard from effectively examining any ballots on election day, except in five counties in New Hampshire, and in a very few other places outside of New Hampshire, and in those venues in a very, very, insultingly limited way. You need only read the first few paragraphs, but the entire article is extremely worthwhile. Thus, for the first time since the dawn of the computer election age circa 1973, a Presidential candidate in a major party, and another national figure with a big microphone (best selling author Roger Stone) has PUBLICLY voiced the possibility that a Presidential election might be rigged. In swift response, various big media mouthpieces, including pundits on CNN, Fox, the Washington Post, as well as on other outlets, reacted immediately, decrying in one way or another that Trump was trying to “undermine democracy”. In the Breitbart interview, Roger Stone hit the EASILY-RIGGED computerized elections that are slated to take place in November. Computerized election fraud is the MAIN WEAPON the Old Guard Plutocrats (who own the computerized election machines) are considering using to “defeat” Trump, if all else fails. Here’s the July 29, 2016 Roger Stone YouTube video on Breitbart, followed by the one minute Trump Video in Columbus, Ohio on August 1, 2016 — and below the two videos is a transcript of the Stone video on Breitbart, followed by a few other items and our commentary. And here’s the video of Donald Trump at the August 1, 2016 Columbus, Ohio rally warning that the November Election may be rigged against him, thus stealing the will of the voters and the destiny of the American nation, and the world. Republican strategist and long-time Donald Trump confidante, Roger Stone, joined Breitbart‘s Milo Yiannopoulos on the July 29, 2016 episode of the Milo Yiannopoulos Show to discuss election fraud and how Trump has the ability to combat it. I think your audience knows, I think we all know, that in this day and age, a computer can do anything. These voter machines are essentially a computer. Who is to say they could not be rigged? Of course they can. Now, you ask me why the Republicans don’t do it, I – sadly I think they do. That’s why I briefly had to leave the Republican Party and become a Libertarian. I have no doubt that after the last election, when Karl Rove, who was George Bush’s campaign manager and a Romney partisan, insisted that, “No no, your numbers have to be wrong,” he said on Fox, [as if] Romney definitely carried Ohio. Milo Yiannopoulos: This stuff is going to horrify most voters, I mean this is amazing. Roger Stone: There’s a mathematician called Richard Charnin, a very eccentric fellow. Last time I met him he was wearing a ski jacket in 90 degree weather, he’s one of those. (Laughs from Milo) He’s also brilliant. He’s a retired mathematician and he’s a genius. Milo: Do they typically move in one direction? Roger Stone: Oh, yeah, the elections are rigged for one entity or another. So, who are the perpetrators? The perpetrators are the people who manufacture and sell these machines. The most common electronic voting machine, which is really just a computer, is a company called Diebold. Diebold’s top executives and owners of the company are major donors to the Bushes. Is this a major factor on how George W. Bush quite improbably beat John Kerry? An election that in all truth on paper, Kerry should’ve won, and Bush should have lost. We will have a constitutional crisis, we will have widespread civil disobedience, and the government will no longer be the government. If you can’t have an honest election, nothing else counts. Milo: So, I mean the dream here, the ultimate ideal is that he wins by such a significant margin nationally that this is unnecessary. But it’s interesting to hear you say this, and it’s funny also, because Trump will go there. He will go to the places other politicians won’t, and he’s probably the only person to run for president in the last fifty years who would dare to do this, and might even get away with it. It’s remarkable, isn’t it, how he’s just sort of re-injected reality into politics. You can listen to the entire show, as well as previous episodes on PodcastOne now, or listen to the show on the move by downloading it for free on iTunes. Rigged Computerized Election “counts” are the only thing that can possibly “elect” the hideous candidate, Hillary Clinton, to the Presidency. We MUST demand that the easily-rigged computers be thrown out, and that PAPER BALLOTS be hand-counted by neighborhood citizens in each precinct BEFORE the ballots leave the public sight. Hillary cannot be elected, but can only be SELECTED by those behind the 3 mega-private corporations (ES &S, Hart, & Dominion) that, as things stand, will control about 96% of the secret, computerized vote-“count” for the upcoming November Presidential election night. The Election Nite Gatekeepers, which include the 5 Big TV Networks and AP wire (again, see the menu tab “Election Nite Gatekeepers” at OpenLetterToDonaldTrump.com ), are aligned against the Trump Campaign. Mr. Trump AND THE AMERICAN PEOPLE are in a round-robin-vice of lying Big Media Coverage, phony “public opinion polls” paid for or publicized by the same Big TV networks. (these phony public opinion polls are being released now and in the months ahead to prepare the public for the coming phony exit polls to be released on election day. These mysterious exit polls are all conducted under the supervision of National Election Pool, or NEP, the crooked company owned by these same 5 Big TV Networks and AP wire. These phony BIG NETWORK exit polls are released on election day to prepare the public for the phony November Election Night rigged-Computerized “results” which the 5 Big TV Networks plan to publish and announce for Hillary, IF they think they can get away with it. The only way the 5 Big TV Networks can be stopped from computer-rigging the November Election for Hillary — is for Mr. Trump and all his supporters to focus all eyes on the rigged process of computer election “counts” NOW, and continuously, from now until the November Election. If that happens, the Old Guard behind the Election Nite Gatekeepers will probably fear having all their easily-rigged computers thrown out of the USA election process for good. If the oligarchs behind the 5 Big TV networks and the other Election Night Gatekeepers fear that 50% or more of the American people will believe that the Presidential election was computer-rigged if Trump “loses”, then they may back off of fixing the election for Hillary. This fear can only be into the Election Night Gatekeepers by Donald Trump himself – by him bringing up this issue with precise language in every speech and in as many interviews as possible, and especially in the Presidential debates with crooked Hillary. If Donald J. Trump would include this in every one of his speeches, and especially in the Presidential debates, then he would set the nation on fire, and make it very difficult for the Election Night Gatekeepers to rig this election for crooked Hillary. As we stated above, after Trump raised the issue of Election Fraud possibly being perpetrated against him and America on November 8, 2016 — the guilty Big Media began to panic. Here’s quote from the article: “Trump added that he has heard ‘more and more’ that the November election will be rigged — suggesting to his supporters that the outcome of the election is out of the hands of voters. “Hillary Clinton’s spokesman Brian Fallon mocked Trump on Twitter Tuesday morning, writing, ‘Even for a reflexive conspiracy theorist like Trump, this is pathetic. It’s dangerous, too.’ ” End Quote from CNN article. Dangerous? Yes, dangerous to the Big Media moguls who belong in jail for protecting the stealing of America over the last generation via treasonous censorship – as well as for being an integral and essential part of the evil Election Nite Gatekeepers. Chait turns reality on its head like most of these lying Big Media employees/mouthpieces do. We are elated that Mr. Roger Stone has become the most visible voice to call for EXACTLY what is needed, and exactly what this website has been calling for since about September of 2015. In this he adds his voice to Mr. Gary Forbes, the publisher of Trump Magazine online. And we are more than elated that Trump has interjected this issue into the national dialogue. We hope that both Roger Stone and Donald Trump, and everyone else, will read this section, because fighting computerized Election Fraud deceptions is a very precise business, requiring very precise language. — Use ELECTION FRAUD instead of VOTER FRAUD. Election fraud is accurate, because under the current circumstances, it’s the 3 mega-corporations who are the main ELECTION VENDORS (ES &S, Hart, Dominion) who have the MOTIVE, MEANS, and OPPORTUNITY to commit election night computer fraud with no challenge from the brain-dead or opportunist election officials who hire them, and certainly with no challenge from the complicit Big Media, either at the national or local level. These three mega-election vendors can silently switch thousands or millions of votes on election night, with impunity. Finding doubt that the winner is already determined. And it wouldn’t surprise me that the reason Mr Trump is the Repulican candidate because Hillary would not have beat Cruz, Rubio, and they wouldn’t have been able to dig up dirt on anyone else and they knew these erased emails would be a problem unless they could invent a scandal that would be believable to everyone. That are so calculating.